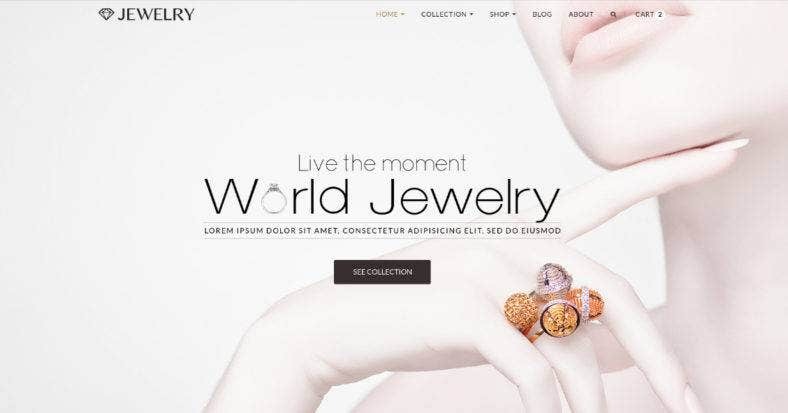 Let your jewelry eCommerce websites and online accessory stores exude elegance and sophistication with this collection of fancy and luxurious eCommerce website themes. If you’re dealing with such luxurious products, isn’t it just right to place them in an equally stunning digital space such as the websites generated by these themes and templates? Not only that. The templates you see below don’t just possess stunning aesthetics, but more importantly; they are loaded with a number of powerful features that will help you run a successful online store. These themes are packed with all the necessary features as they sport responsive designs, have cross-browser compatibility, and are SEO optimized. So, get these templates, and have your online shop running in no time. First of all, is this beautiful jewelry store WordPress theme comes with two versions: the user-friendly one-page theme; and the multi-page eCommerce store theme. Whether you’re dealing with a single product or a collection of items, this theme will perfectly cater to all your needs. Royal Jewelry is highly customizable and is loaded with tons of practical and powerful features. 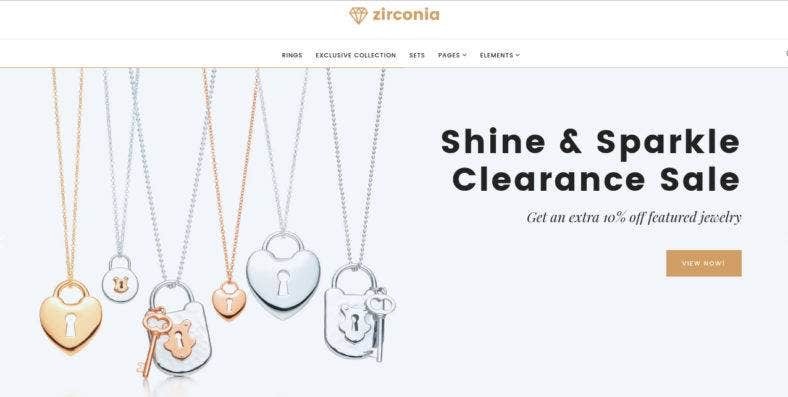 One of the best-selling WooCommerce theme, Zirconia is an elegant and responsive theme that is made especially for jewelry and accessories. It comes with a collection of dynamic features that lets you create a reliable website with first-class productivity. With the drag-and-drop page builder, Cherry plugins, and multiple layout options, your website will definitely look good. Another responsive WooCommerce template is the above theme, Adamas. The theme features: an Aqua Page Builder with lots of custom modules that you can use; a Revolution Slider to create stunning slideshows and highlight products; Ajax loading of projects and posts on the front page; and an unlimited set of colors you can choose from with a convenient color picker. 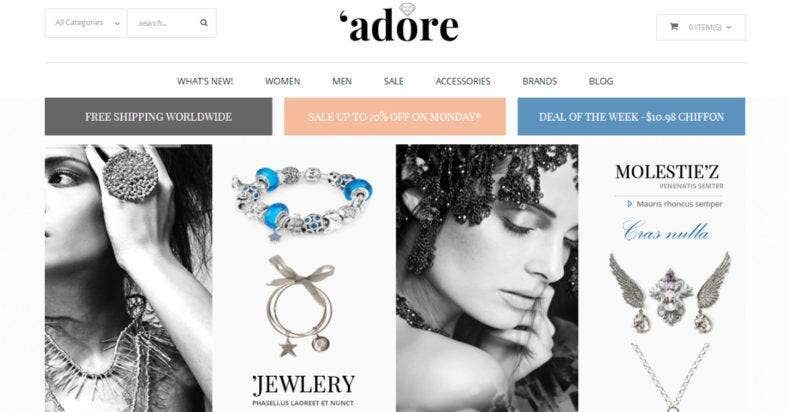 Adore is a fluid and responsive Magento theme that is used to sell different fashion items like: jewelry, watches, glasses, and other accessories. It comes with 10+ custom designs and various styles that are suitable for every purpose. Aside form that, the theme also features some cool attributes such as the visual Megamenu, Ajax advanced products filtered navigation, and more. This responsive Shopify theme gives you a clean and minimal design to highlight your beautiful jewelry products. Jewelry is also a multipurpose template that comes with a fullscreen image slideshow, mega menu, advanced filter, and multiple layouts to ensure an equally stunning website. Along with other features, it is a popular and trendy theme that you shouldn’t miss. The elegance exuded by this PrestaShop theme is perfectly suitable for luxury items such as jewelry and watches. Elegant Timepieces provides a black and white aesthetic heavy with large product images for a striking and dramatic impact. The theme is also loaded with awesome attributes such as the built-in one-click switcher that enables you to change its look easily. 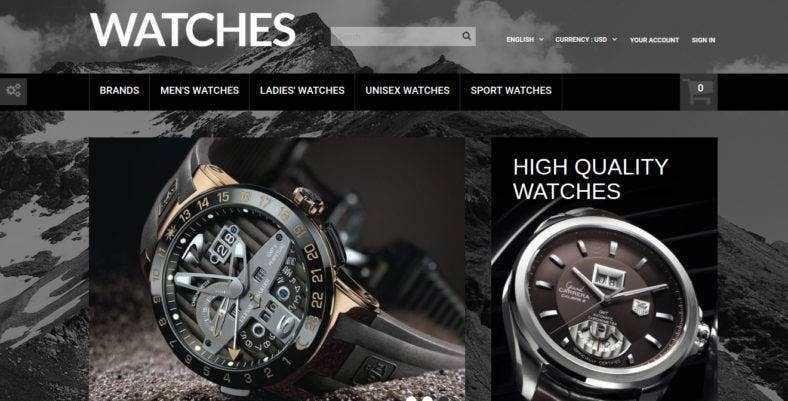 Another sophisticated eCommerce template for selling beautiful timepieces is Watches. This theme is characterized by a black, white, and red color palette with a classic website layout and high-resolution product images. It is also integrated with some cool features such as a responsive design, cross-browser compatibility, custom page templates, social options, and much more. If you’re looking for a trendy and stylish theme for your brand of products, then, Shine is the perfect one for you. This Shopify theme features a bright colored-grid layout that categorizes your products in a well-organized but interesting way. The theme also includes amazing features such as a MegaMenu, slider, product carousel and badges, sorting options, and a blog. 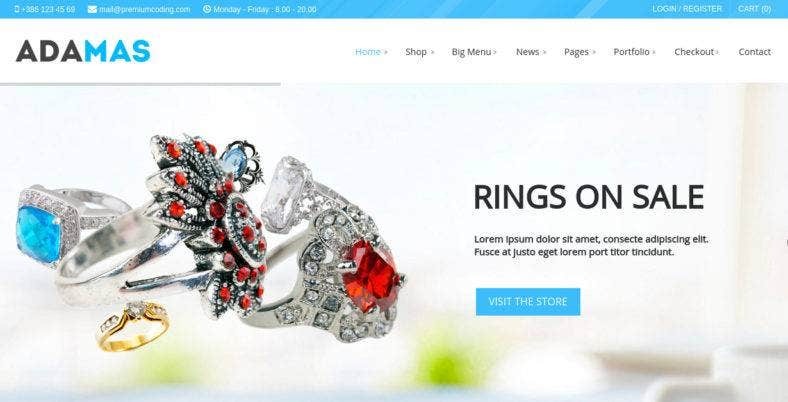 With a classic and elegant look, Diamond Store is a premium Magento template that comes in two versions: jewelry and glasses. It can still be modified, however, to fit other types of products. It has a clean and modern look that is extremely customizable and easy to use with its advanced admin module. Its powerful theme settings let you change the look of your website effortlessly. 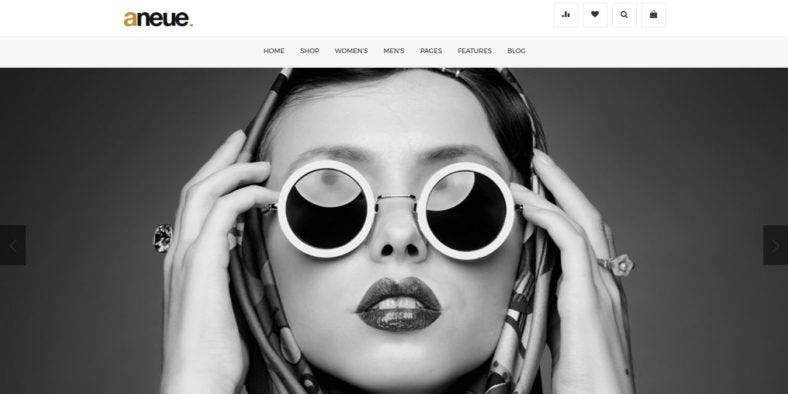 Lastly is Aneue, a glasses store Magento 2 theme that consists of a minimalist aesthetic with a beautiful full-width image slider, gorgeous typography, and icons, and lots of functionality. This template features some powerful theme options and configuration settings. These make it highly flexible and versatile. It can also be used for other fashion products and online stores. Have you browsed through the themes? Were you able to find what you’re looking for? We certainly hope so. For more ideas and inspiration, why don’t check out other eCommerce compilation available here at Template.net? We even have a list of the best multipurpose themes for eCommerce websites.